It’s the time of year again when we don our bad guy costumes, festoon ourselves with holiday cheer and go out and celebrate the start of the Christmas season by participating in the Reston Holiday Parade! We had our biggest group to date last year, and I expect to see the same type of numbers marching with us this year. We are very popular at this event, and it’s grown into a real tradition over the 8 years we’ve participated. As in past years, we are registered under own own name, and will most likely be late in the parade a few entries before Santa. This is a relatively short route, but is EXTREMELY well attended, and we have routinely had news coverage as well as enthusiastic welcomes at the grandstands along the route. Number of participants: Anyone who can make it! We will have a vehicle in the parade, and any help in dressing it up to meet the theme will be greatly appreciated. Any approved costumes are welcome. Add holiday flair as you’d like, but please keep it within the realm of seasonal additions to the costume. Children may participate, but will need to be supervised. Non-costumed participants will bring up the rear of our entry. We will be marching in an organized manner in this parade. I will hold an optional open practice session in November, details on the place and date forthcoming. Any help from people familiar with this type of exercise is welcome. I will have further details as the date gets nearer, and will be updating this thread with more information and attendance as we go. If you are planning to attend, please post who will be attending and costume type. 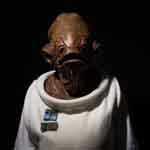 I will be attending as Admiral Ackbar. This is always a fun parade, and there are a lot of people attending from GT.